When it comes to older dogs, we often overlook switching to the best senior dog food. For many dog owners, our beloved friends seem not to age -- or so we think. However, diet can be an essential part of keeping your older dog healthy so they can enjoy their golden years. This is why you need to realize that at some point in your four-legged friend’s life, you will have to switch their diet to senior dog food. For smaller breeds, that switch should take place at around 11 years of age while larger breeds should make the switch a couple of years earlier. Whether you pet is starting to show signs of growing old (weight gain and reduced activity) or not, it is still advisable that you switch their food at that age. For you to enjoy your dog’s company for a long time, you will need to understand what makes for a happy and healthy dog. Just like human beings, our beloved pets have many requirements that we need to make sure they meet for them to enjoy optimal health. Let me show you four of them. Yes, dogs understand love too. In fact, they probably understand the concept of love more than their handlers. Your dog needs love. To meet this need, play with them, pet and cuddle them, and give as much attention as possible. Originally, dogs roamed the wild freely. I’m sure you agree that the wild was a pretty big playground. That means they got plenty of exercise. You don’t have to take him back to the wild, but you can take him to a nearby field, park, or just a few rounds around the block to keep him fit as a fiddle. Regular exercise will help your dog maintain his health and weight. A proper diet (in quality and size of portions) is essential in ensuring that your pooch lives the best, healthiest, and longest life it possibly can. That is why, as your dog ages, you need to get them the best senior dog food as it meets all the nutritional needs of an elderly dog. And this brings us to the topic of our discussion today -- the best senior dog food. When the time comes to switch your aging dog's diet, you’ll have to consider getting them the best senior dog food available. After all, they are your best friend and as such deserve nothing but the best. But what’s all the fuss about switching diet? One of the biggest reasons you need to switch to senior dog food is that the dietary requirements of your dog change in its advanced years. For instance, it will need more protein and Omega-3 fatty acids while you reduce sodium and fats. The best senior dog food ensures that your dog gets exactly the right balance of nutrients needed at this particular stage of their life. As a dog gets older, it becomes more susceptible to many health-related issues. For example, bone density might reduce if calcium is in short supply, leading to arthritic joints. Other risks include inflammation, obesity, and a whole lot more. Fortunately, senior dog food is formulated to help combat age-related health issues, increasing the chances of your senior dog to enjoying its golden years. As dogs grow older, they begin to move a bit slower than they did when they were young, just like humans. The reduced activity levels can lead to obesity and other health issues. Senior dog food is formulated to give your older dog more energy so that it can maintain a healthy exercise regimen. One thing you need to understand is that just like human beings, dietary requirements are not the same for every dog. To equip you with the most accurate information on the best senior dog food we took a few factors into consideration. Not all dog food is the same. It is critical that you consider the formula of the food when choosing the best senior dog food. The best dog food formulas take into consideration the dietary and energy requirements of older dogs. They also take into account the fact that as dogs grow older, their ability to digest becomes more difficult. Who better to paint a clear picture of a satisfactory product than actual users? But because the dogs themselves can’t talk to us, we asked the people who understand them best -- their owners and handlers. 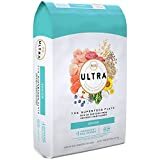 These reviews include ease of transition and other factors that make them (and their dogs) happy with the senior dog food. Ready to go shopping for the best senior dog food? Let’s get to it then. When it comes to getting your elderly four-legged friend the best senior dog food on the market, you have to be willing to spend a bit more than you would for regular dog food. But the investment is well worth it as it can not only improve the quality of your dog’s retirement years but may also help extend your pet’s lifespan. Nutro’s ULTRA Senior Dog Food is one of the best senior dog foods you can find on the market. 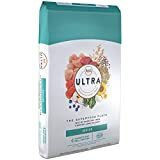 This rather pricey senior dog food has a lot of proteins sourced from free-range sources (chicken, salmon, and lamb) to ensure that your dog gets the best of the best. Not only do the proteins promote healthy muscles and tissues but other protein sources like salmon also contain omega-3 fatty acids that help combat issues such as inflammation. Also included in the formula are more than 15 superfoods including flaxseed, sunflower oils, tomatoes, coconut, and whole egg among others. These superfoods are an excellent source of chondroitin and glucosamine, nutrients that promote a healthy coat and joints. One of the biggest advantages of this formula is that it doesn’t contain wheat and corn. That makes it entirely safe for dogs that have food allergies. This also makes it easier to digest, especially since the only grain in the formula is rice, an easily digestible source of much-needed fiber. If your pockets are deep enough, this is one senior dog food you definitely need to consider getting for your pooch. And if your pooch has lost some teeth (or simply prefers wet food), Nutro also makes Ultra chunks in gravy. It was given an Amazon customer rating of 4.5 out of 5-stars. The food costs between $30 and $80 depending on what size you purchase. 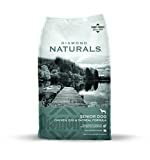 For dogs eight years and above, Diamond Naturals is a great senior dog food to switch to. Not only does the formula contain high-quality protein, but it also comes with a few other added nutrients that are essential to an aging dog's health. This superb senior dog formula is packed with vitamins and minerals to ensure good health. But more than that, it also contains fatty acids and vegetables too. This is certainly one of the healthiest formulas you can find on the market. The biggest advantage of Diamond Naturals senior dog food is the great antioxidant profile. Packed with great antioxidants that help mitigate the effects of stress that are heightened by aging, this senior dog food will ensure that your dog’s health remains optimal. Is it the best senior dog food? It may or it may not be. But one thing is sure. It will definitely help keep your dog healthy, happy, and strong. The food costs between $10 and $40. It has an Amazon customer rating of 4.0 out of 5-stars. As the name suggests, Wellness Complete Health Natural Dry Senior Dog Food focuses on wellness. It aims at keeping your dog in perfect shape in his or her golden years. The formula is all natural and is low in calories to ensure your dog maintains a healthy weight. Among other things, Wellness Complete Health contains delicious deboned chicken, peas, and barley. This not only makes for a tasty and healthy meal but a satisfying one as well. For the promotion of healthy hips and joints, glucosamine and chondroitin are added to the already healthy meal. The downside to this otherwise perfect dinner is that many dog owners reported it to be a bit of a problem when it came to transitioning. Other than that, when their beloved pets got past this, they seem to love the taste and texture. For a dog that will maintain its good health past its prime, this could be the best dog food you can switch to as your pooch gets older. Perhaps because of the transitioning problems, switching a bit earlier would be better with this one. 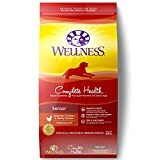 Wellness Complete Health Natural Dry Senior Dog Food has an Amazon rating of 4.0 out of 5-stars. It costs between $15 and $60. This senior dog food by Blue Buffalo is another dog food that will definitely sit well in your elderly dog’s stomach. Blue Buffalo calls the food “Life Protection Formula” for very good reasons. It contains a nutrient profile formulated to support your dog’s vital functions as it gets older. The formula contains a well-balanced mixture of chicken for protein and brown rice for carbohydrates (energy) as the main base. Additionally, BLUE’s proprietary LifeSource Bits formula includes seven powerful vitamins, minerals, and omega-3 fatty acids. BLUE Life Protection Formula is an excellent choice of senior dog food as it helps maintain muscle strength, joints, and your dog’s lovely coat. All this while keeping your pooch’s bowel healthy too as it doesn’t contain soy, wheat, or other hard to digest grains. BLUE Life Protection Formula costs between $14 and $50. It has an Amazon customer rating of 4.2 out of 5-stars. One major dietary requirement for older dogs is good quality protein. And that’s exactly what Orijen senior dog food provides your dog with. Some of the ingredients that make up the bulk of this food are free-run chicken and turkey, whole eggs, and wild-caught fish. This natural protein formula is also easy to digest, is flavorful, and promotes joint and hip health as well. Your dog’s coat will also benefit from the additives as they promote a healthy shiny coat. Orijen’s natural formula is one of the best senior dog food formulations on the market and is well worth the price if budget permits. This easy to digest food costs from $24 to $90. It has an Amazon rating of 4.2 out of 5-stars. The humble avocado is famous for being one of the best superfoods on the planet. And now it has been included in one of the best senior dog foods on the market -- AvoDerm Natural Health Food+. AvoDerm’s natural formula includes other superfoods like alfalfa, tomato, and peas. That's on top of rich protein sources such as chicken, lamb, and salmon. This potent formula is certain to keep your dog’s tail wagging for years to come, not only because of the health benefits but also because of the great tasting flavor. 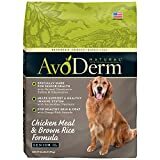 AvoDerm Natural Health Food+ is an excellent dog food for the senior canine members of the family. Besides giving your pooch a healthy coat and bones, it also helps fight inflammation thanks to its excellent antioxidant profile. Amazon customers rated this food 4.5 out of 5-stars. It costs between $30 and $55 depending on what size you buy. Nature’s Variety Raw Instinct senior dog food is an excellent choice for breeds (or individual dogs) that are prone to losing their sight as they grow older. This chicken and turkey based no-grain senior dog food also contains salmon. It provides omega-3 fatty acids and DHA for brain and eye health. Top that off with freeze-dried raw pieces and mealtime will be an event your dog will always look forward to. For improved digestion, Nature’s Variety also contains probiotics that aid in digestion. This ensures that your pooch’s stomach never experiences discomfort. One of the best qualities Nature’s Variety brings to the table is the high protein density. It also has a low moisture content that makes it more nutritious. Nature’s Variety Raw Instinct is great for a more natural and organic diet. It is one of the best senior dog foods you can get for your furry friend. This food can be a bit pricey, however. It will cost anywhere from $20 to $55. Amazon customers loved it and rated it 4.3 out of 5-stars. There’s no question about it. You need to get your aging dog the best senior dog food. It is one way you show how much you love them after all. If your dog is approaching its senior years (8+ years), giving them the best diet to enhance its strength and health is the least you can do for them. So which is the best senior dog food for your beloved pet? Well, they are all highly rated and will definitely make for a great meal for your dog. But if I were to make a choice, I would go for BLUE Buffalo Life Protection Formula. It strikes the perfect balance between nutritional and economic value. If you have a senior dog, we would love to hear your recommendations in the comments section below. Image: Public Domain US, Max Pixel, via Wikimedia Commons. Iams Dog Food: Is it a High-Quality Option for Your Dog?